Happy Mother's Day to all Mothers and (ahem) Fathers who are playing the role of a mother for whatever reasons! Being a mother is... indescribable. There are days when your heart just want to burst because it can't contain all the love in the world you feel towards your children. But there are also days when you cry on your own, thinking - what have I got myself into? Seriously, motherhood is complicated. At least for me. From not wanting to breed, to needing to breed desperately to actually breeding (sorry if it sounds crude to you guys). That is how I describe my motherhood journey. Here are snippets of my thoughts on motherhood from the first year of marriage till I become a mom. 2006, December 15 - we got married. Truth be told, I wasn't into my marriage wholeheartedly because I believed at 24 years old, I was too young to be carrying the responsibilities as a wife. What more to be a mother? So I told people - lay it off. I'm still trying to learn my rope and get my head wrapped around the idea of being married, so don't talk about kids yet!! - How's The Baby WIP? Akhir-akhir ini, kami selalu berbincang soal yang serius. Soal anak.Atau sebenarnya. Aku selalu berbincang soal yang serius. Nama bakal anak. Malam semalam, lepas membaca bedtime story book (katalog IKEA! ), kami berbual-bual sebelum berguling2 mendodoikan mata. Topik yang sama dibincangkan. The idea is planted. Yet the heart is not too sure. After all, we were barely one year into our marriage. By this stage, I was mulling over the thought lightly. 2008 (middle of the year) - ok, let's do it! A few weeks ago, Suami Terchenta & I decided that we should definitely start a project together, and that is called the 'Baby #1 Project'. We have different opinions to the objective of the project though - Suami Terchenta couldn't wait to pass on his gene and I couldn't stand to go back home for Raya without 'the good news' as everyone in our families refer to it. I guess after 1 and a half year of being together, we finally decided that our relationship is stable enough to bring a child into the love equation. Only... it wasn't as easy as we thought it was! Maybe I shouldn't be arrogant in the first place, telling other people that making babies can be put off until we want to. The truth is - although we want a baby now, it's not just up to us to decide his/her arrival. So we sought professional help and went on fertility treatment for our first attempt. 2008 (pregnant with first baby) - Yeay, pregnant at last! Despite the fragile condition of my planned pregnancy, I was super excited of the prospect of having my own kid. Surprising, isn't it? I truly soaked up in the experience, asam craving and all. Maklumlah, first pregnancy. Memang mengada-ngada sikit. 2008 (12 weeks later) - ... but we lost the baby. Even years later, I still remember the pain of losing my firstborn. It was like a dream crushed, like having a gaping hole in my heart and I carried the pain for months to come until the day I held Khayla in my arms. Thinking of you, my little angel. 2009 - still no baby. I became obsessed with the idea of being pregnant. Still, life moves on. Still. Something is bugging me at the back of my mind. Still the little one is not coming. He who was to be the ultimate birthday gift to Suami Terchenta this month, or so I thought 9 months ago. Be at peace, my son. 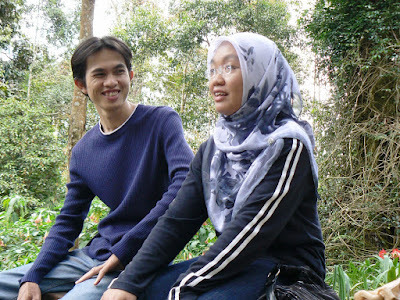 - This is My Life..
2010 (early of the year) - ... to the point I got depressed when people asked how come we are still not pregnant? So we decided to keep our minds occupied so we don't have to think about baby anymore and get all depressed. We signed up for MBA together. Then I contracted chicken pox for the first time ever in my life, lost my weight and boom! I was expecting without knowing it! 2010 (end of year) - and then we found ourselves with the rainbow baby. Thirdly, ini ialah official announcement. Tahun ini juga, kami sangat produktif. Dalam keterujaan nak sambung study, tup-tup dapat tau. Akhirnya, En Suami akan bergelar seorang ayah. At first, rasa nak baling test kit dalam mangkuk toilet dan flush. Bukan sebab tak suka, tapi sebab tak percaya. Tapi, percubaan kali kedua dengan test kit yang lebih mahal akhirnya meng 'convince' kan kami untuk berjumpa doktor dan 'confirm'. Syukur alhamdulillah, rezeki itu datang jugak. Tak payah buat treatment. Tak payah gi jumpa specialist. Ini dinamakan kuasa Tuhan. This time around, the pregnancy was kept a secret and the whole time, it felt like riding a roller-coaster with specific instructions not to make a sound throughout the ride! One moment our joy of carrying a viable pregnancy escalated high enough to reach the sky, but suddenly I found myself bleeding and our emotions plunged down at horrifying speed and we constantly found ourselves bracing for impact of hearing the news that the baby didn't make it. Phew. Pregnancy is a roller-coaster ride of emotions, I kid you not. Just as the caption says - 2010 marks a turn towards the better. 2010 (3 days before our girl Khayla arrived) - saying goodbye to couplehood, bracing myself for motherhood. I know this may sound weird considering that we are over the moon about this pregnancy, but I know I shall miss the world of two-some. No more before sleep cuddles. No more on the spur of the moment dates. I know that there is no way we will trade this chance with all that. 2010, December 15 - A mom at last! She is our rainbow baby. 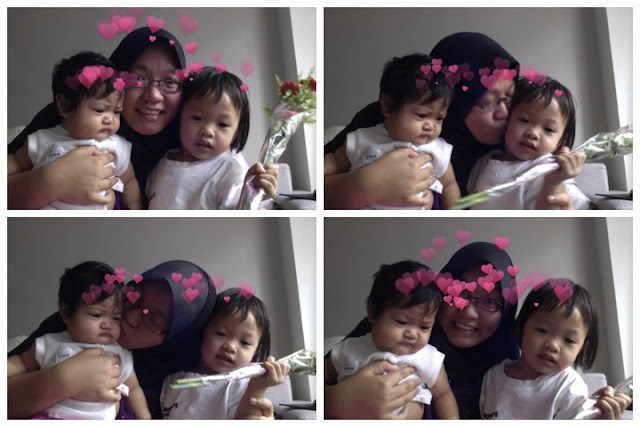 The subsequent journey is filled with joy (going on outing with my baby to watching her sleep), guilt (of scolding them to leaving them for the sake of finishing up my studies) and weariness of being a mother to the point where I went into hiding from my children. Yet, I know I can't bear to lose them for they have stolen my heart from the day they were conceived. They became my rock, my world and my everything, despite everything that I had to go through for them (c-sec, diabetes and getting induced among others). Without them, I would never know the depth of my love, nor would I know true strength as only a mother knows.